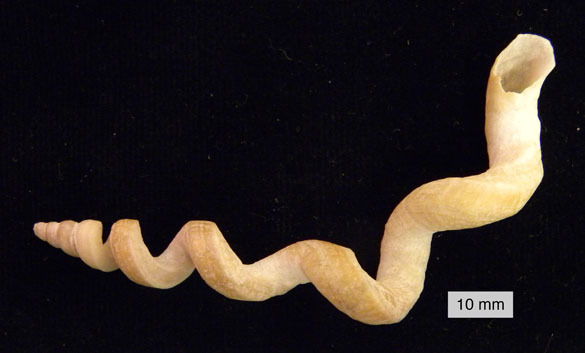 It is hard to believe that this twisty tube is a snail, but it is. 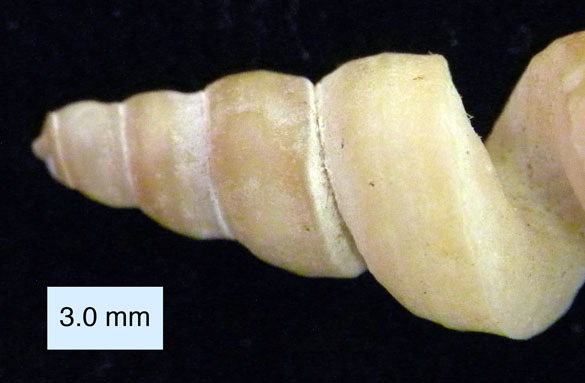 Tenagodus vitis (Conrad, 1835) is the scientific name for this worm-like gastropod from the Claiborne Sand (Eocene) of Alabama. It was originally named by Conrad as Siliquaria vitis, a name still commonly used even though it was made a junior synonym by CoBabe and Allmon (1994). This kind of gastropod with its awkward shell clearly didn’t crawl around. It was a sessile benthic epifaunal filter-feeder, meaning that it lived stationary on the seafloor filtering organic material from the water. Some of these sessile snails twisted their tubes around each other and formed a kind of gastropod reef. The twisty part of Tenagodus vitis shows its true snaily nature. 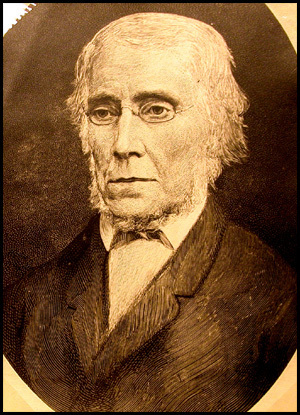 The discoverer of Tenagodus vitis was Timothy Abbott Conrad (1803-1877). He was a conchologist (one who studies shells) and paleontologist in New York and New Jersey, and he was a paleontological consultant during the early days of the Smithsonian Institution. CoBabe E.A. and Allmon, W.D. 1994. Effects of sampling on paleoecologic and taphonomic analyses in high-diversity fossil accumulations: an example from the Eocene Gosport Sand, Alabama. Lethaia 27: 167-178. Conrad, T.A. 1835. Fossil shells of the Tertiary formations of North America, illustrated by figures drawn on stone by T.A.Conrad. vol. 1, no. 3, p. 29-56, pl. 15-18 (pp. 77-110, pl. 15-18 in 1893 reprint by G.D. Harris [with pl. 19-20 not included in original by Conrad], reprinted 1963 by the Paleontological Research Institution, Ithaca, NY).